Dancing masqueraders welcome visitors arriving at RLB International Airport. BASSETERRE, St. Kitts — St. Kitts and Nevis continues to experience increased visitor arrivals according to the latest statistics revealed by the St. Christopher Air and Sea Ports Authority (SCASPA). Additionally, there has been an upsurge in flights coming into the RLB Airport. “Some 7,947 flights came to the RLB Airport in 2018 – up 315 over the 7632 flights in 2017,” the prime minister said. Furthermore, cruise tourism continues to boom, necessitating a second cruise pier at Port Zante, which is presently being constructed. This pier will be able to accommodate two Oasis-class cruise ships. On Jan. 5, RLB Airport broke records with the most passenger arrivals in any given day in its history when 2,728 passengers travelled though the airport. “Our Administration must seriously determine the next steps in the modernization and expansion of the RLB Airport,” Dr. Harris said. 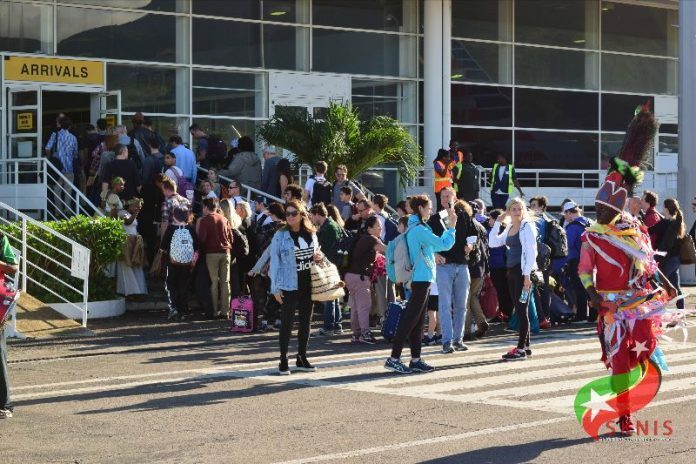 “In the interim, the St. Christopher Air and Seaport Authority (SCASPA) and related Departments such as Tourism, Immigration and Customs will work cooperatively with other stakeholders to determine and implement measures to enhance the customer experience at the RLB Airport,” Prime Minister Harris said.